Today was sadly our last full day in Japan but we made the most of it with a day trip to one of Japan's historic capitals, Kamakura. After waking up early, getting ready and having breakfast, as per usual, we caught a train to Tokyo and transferred to a Yokosuka line train bound for Kamakura. Strictly speaking though our first stop for the day was not located in Kamakura at all but was actually technicality part of Yokohama! Our destination was the Taya Caverns which are a large network of caves which were excavated by hand by Shigon Buddhist monks in an attempt to reach enlightenment around 300 - 800 years ago. The reason we planned to visit them today rather than yesterday was because while technically within the bounds of Yokohama, historically and physically speaking the caves are much more closely related to Kamakura. While close to Kamakura the caverns were not exactly in the town centre either and so we got off our train a couple of stops early at Ofuna Station. After arriving we still had a little over two kilometres to cover so we walked over to the bus terminal in order to catch a bus that would take us the remainder of the way. A quick consultation with the Japan book indicated that we should "Take a bus bound for Totsuka Bus Centre; after about 8 minutes, get off at Dookutsu-mae bus stop". While more helpful than yesterday’s advice for Zooasia it was still a little vague as I did not know what buses were bound for the Totsuka Bus Centre. Fortunately though there was a big map at the terminal that listed all the attractions and bus routes in the area. While not prominently featured we were able to find the Taya Caverns on the map and hence work out what bus stop we needed. After a short wait the bus arrived and we hopped on. Since it looked like we'd be able to use our Suica cards we showed them to the bus driver and he asked us "どこに行きますか？" (doko ni ikimasu ka = Where are you going). I said we were going to Dookutsu-mae and he keyed in that location so that when we touched on the correct amount was deducted. After a short trip we heard our stop, pushed the bell and got off. The area was semi-rural with some open fields as well as a few houses. The caves were located at Josenji Temple which was only a few steps are way for the bus stop. As we approached Kate mentioned that she hoped she'd be alright as she was only carrying a ¥10 000 note! As I only had exact change and a ¥10 000 note myself I wasn’t able to give Kate any of my money either. The temple where the caves were located looked pretty quiet with no visitors or anyone at the payment window, which gave us the impression that they might not have a lot of change on hand. We probably would have been alright as our experience has been that Japanese places are really good with their change though we were scared about people stuck in an embarrassing situation. In Australia some places freak out if you pay for something with a $50, let alone a $100. The area was quite quiet but we thought we’d have a look around to see if there was any place we could exchange our money. Kate managed to find a pachinko parlour (vertical pinball gambling venue) and tried to use the ¥10 000 not to buy a bottle of water. Unfortunately though only the pachinko balls were accepted as currency within the parlour and an English speaking staff member was summoned. He took Kate over to a change machine and asked her to put in her ¥10 000. Kate was worried she’d end up with thousands of the little metal pachinko balls but luckily it gave her cash and the crisis was averted. 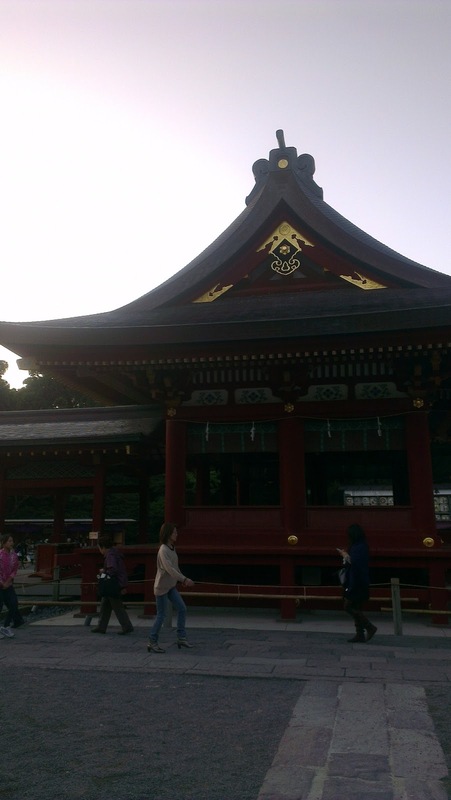 Armed with Kate's lower denomination money we returned to Josenji temple and approached the payment window. Once we arrived at the window a man appeared from the temple grounds, he was actually a bit weird and unfriendly and I think he may have been the temple's priest. Anyway, we paid the 400 yen entrance fee and were each given a candle and directed over to the cave entrance. Unfortunately as photos were strictly forbidden I haven’t got any to share though I'll try my best to describe our experiences. Outside the cave opening we found a bunch of small wooden planks with nails in them as well as a big lit candle. We both grabbed a stick and stabbed our candle onto the nail and used the fire provided by the big candle to light our little ones before delving into the cave. The roof was just a little bit higher than our head and was wide enough to allow one person to easily walk down but too narrow for two people. The caves were very long and very cool to explore. They were also physically cool and the air was very still. Unfortunately though, our movement was enough to threaten the life of our candles and on several occasions they got snuffed out! Fortunately this didn't happen to both of ours at the same time, so we were still able to see. We didn’t have anything to fear though as there were also electric lights here and there (though not heaps) and some of the rooms had big candles we could use to relight our candles. While only 400 meters of the more than 1500 meters were open to the public we still found them to be quite extensive and spent quite a while walking around. We could see down many of the tunnels that were roped off and they disappeared into the gloom. The caves were built into claystone and we could see the scour marks in the walls that the Buddhist monks made when they were digging it out. Not all of the walls had these marks though and we also saw lots of artwork carved into the rock. Also of note were the many water filled channels that were cut by the monks in order to harness and control the natural water that flowed through the rocks. This water was used by the monks during their training and we could hear it dripping and flowing in the distance as we walked around the caves. The caves are quite hard to fully describe but it was definitely a lot of fun and I'd highly recommend it as a visit! Once we exited the cave we had a quick look around the temple but left after only a short while as the guy was watching us pretty intently. We then walked the few steps back to the bus stop and waited for the next bus back to Ofuna station. The road was quite straight and not terribly busy so we actually waited on the other side of the road as there was a seat over there that we could sit on. Although we didn’t hail it, a passing bus actually stopped for us and we had to tell the driver we actually didn't want to get on. This confused him somewhat as all buses servicing that stop were the same; it wasn’t like we could be waiting for a different one on that side. One final thing worth mentioning* was that there was some construction taking place nearby and even though it was a pretty small operation, a vending machine had been installed on the public facing side of the wall. It was mainly aimed at the workers but also meant that non construction workers like Kate could use it to get a drink of water as well. Before long we saw our bus coming in the distance and we caught it back to Ofuna. At the station Kate saw some really yummy looking noodles but unfortunately we could not get them as it was still too early for lunch. This was quite a shame as they were pretty cheap too. We were feeling a little hungry though, so we went to Starbucks instead and got a hot coffee, hot chocolate and a snack. I was going to get another blueberry scone but Kate said that the cherry and custard muffin looked nice and I ended up getting that on a whim. This horrified Kate- what if I didn't like her suggestion!? It turned out to be absolutely super sugoku amazingly delicious! 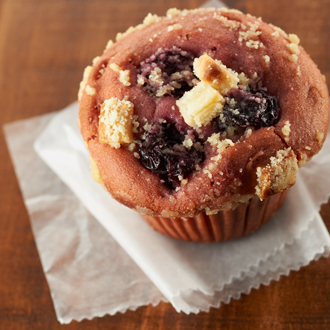 The cherry muffin had an amazing light and fluffy flavour and the custard was moist and superb. I wasn’t sure if it was just mine or not but there was a massive hole in the middle of my muffin. Had I got a dud perhaps? The lady next to us also had a cherry and custard muffin and we tried to look to see if hers had a hole in it as well. She took forever to eat it though! It just sat there for ages without her touching it. What’s more, when she did finally she did start to eat it she somehow managed to keep inside from view the entire time and we were unable to get any confirmation on the regularity of the hole. So as not to leave everyone in suspense I can reveal that subsequent muffins confirmed that the hole is normal and I suspect that the phenomenon may actually be the result of migratory custard. Once we had finished our meal we hopped on a train and got off a stop later at Kita (North) Kamakura station. Compared to Ofuna, Kita Kamakura was a much smaller station with just two outdoor platforms and a level crossing. 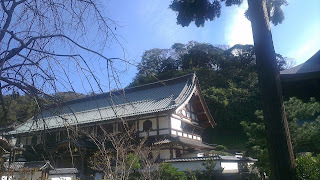 There were a number of different temples located nearby but the one we headed to first was Kenchoji temple, which is number one of the five zen temples in Kamakura. To get to Kenchoji from the station we walked down a foot path along the side of a road that led to and past the temple. It was pretty slow going though as there were heaps and heaps of middle/high school students also making their way to and from the temple. While there were also plenty of non-school aged visitors the majority were school students and it reminded us of all those we had seen during our visit to Kyoto last year. There were a few souvenir and food shops along the road and since we were feeling thirsty we each bought a coke zero from a vending machine along the way. Kenchoji was founded almost 800 years ago in 1253 making it the oldest Zen temple in Kamakura and one of the oldest in all of Japan. The temple is built on the side of a mountain and there are paths leading up the hill to a shrine and an observation area. The path up the hill also forms part of a hiking trail that leads all to Zuisenji, which is another Zen temple that can be reached after an hour and a half’s walk. As we usually like to start at the top and work our way down after entering Kenchoji we followed paths and climbed stairs up the mountain for about twenty minutes until we reached the Hansōbō Shinto Shrine. The Hansōbō shrine belong to the temple and was built to contain the Hansōbō Daigongen spirit from Shizuoka in order to protect Kenchoji. 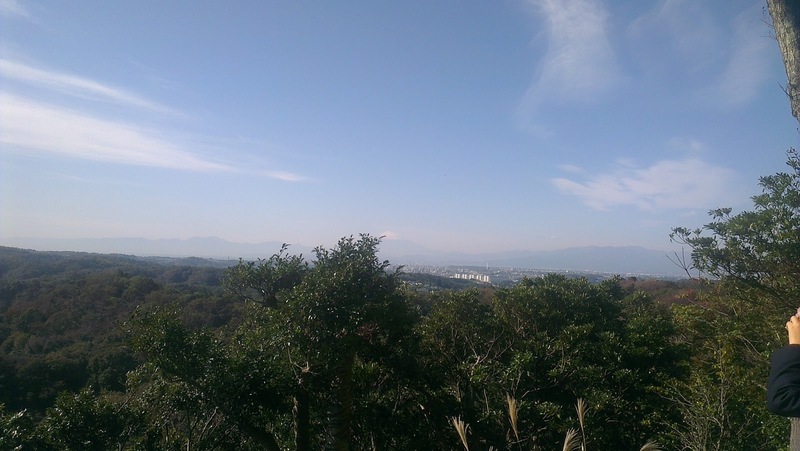 While the shrine itself was fairly simple we were able to enjoy quite a good view of the surrounding area. 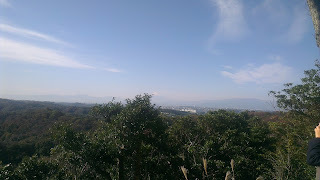 Nearby trees were blocking any view of the temple buildings below but in the distance we were able to clearly see Mt Fuji! It's amazing how much of a nice day it was today compared to yesterday, there was barely a cloud in sight! We made sure to make the most of the opportunity and took lots of photos! While we were appreciating the view a man with a giant camera told us that there was an even better view up the stairs behind us. We took his advice and started making our way up the second set of steep stairs. A group of a about four middle school girls managed to get in front of us before we started the accent so the going was a bit slow. I was already a bit puffed from the first walk though so I wasn't complaining! Once we reached the top we found an observation deck with some seats, from which we could look down over the forest of Kamakura and out into the distance. Buried in the middle of the forest we could see the temple buildings, further in the distance the town of Kamakura was visible near the ocean. While we were admiring the view the school children that came up with us pulled out home packed lunch bento’s which made us jealous as we were both feeling pretty hungry and they looked delicious. Once we’d appreciated the view and had a bit of a rest we headed back down to the main temple area. Along the way we saw some interesting statues beside the steps leading down from the shrine. These statues were built to accompany the enshrined spirit and represent goblin like creatures called tengu. Many of the statues had wings and beaks which has resulted in them being called karasu(crow) tengu. 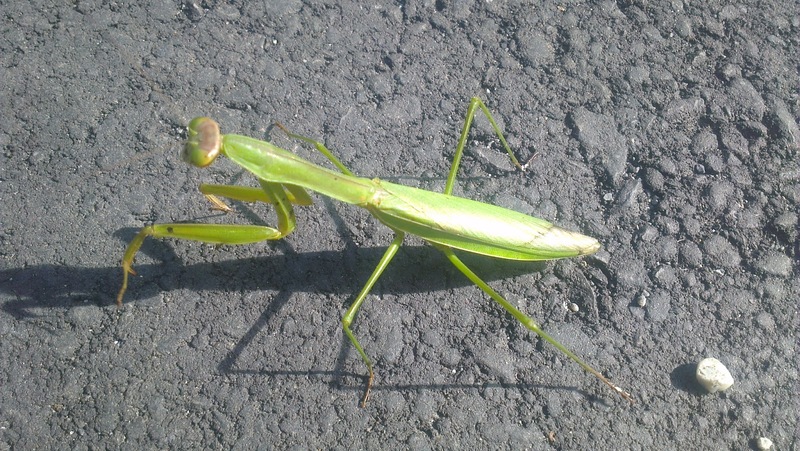 Also along the way down we saw a praying mantis which nipped me with its pincers for some reason. Once we arrived at the main area we had a good look at the different temple buildings. The first building we went to was Hojo which is the main hall and was originally the head priest’s residence. 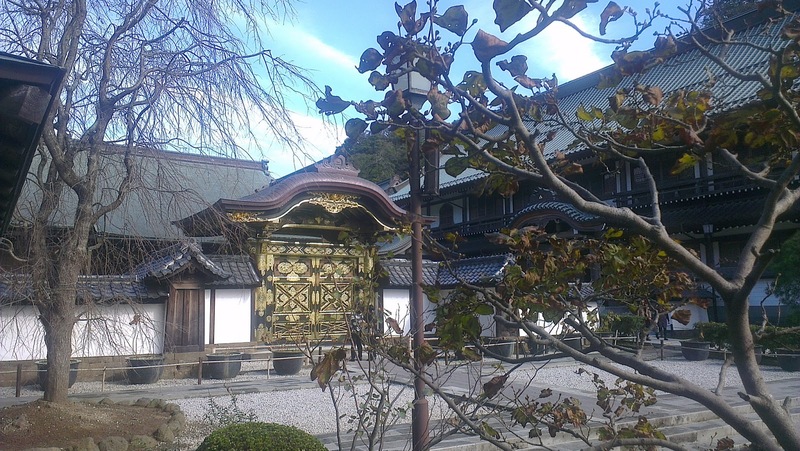 In front of the Hojo stood the Karamon Gate which had impressive and elaborate gold gilding on the front. 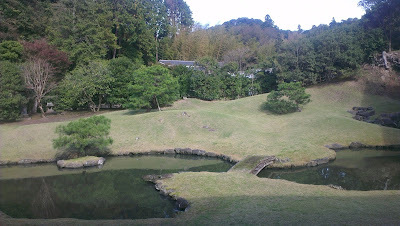 Around the back of the Hojo we had a look at a Zen style garden designed by over 650 years ago my Zen master Muso-Soseki. Another building we looked in was the Hatto (also called the Nengedo, Dharama hall and lecture Hall) which was built in 1814 and is the largest wooden building in Eastern Japan. It houses the Senju Kannon Bosatsu and recently had a black and white painting of “Unryu” or “A dragon in the clouds” painted on the roof. In front of the Kannon statue was another darker statue that had no stomach, I’m not sure what function that one served or who he was but it was pretty scary looking. One other building I remember looking in is the Butesuden or Main hall which had a decorated latticed ceiling and a lacquered interior. Zen temples are usually simply designed and the elaborate interior of the building is due to the fact that it was originally a Jodo sect temple and was brought to Kamakura in 1647 from Tokyo. As the land the temple was built on was originally an execution ground, the main object of worship is a 240cm tall statue of Jizo Bosatsu which was enshrined in order to console the souls of those criminals executed in cruel ways or on false charges. Around the temple ground there were lots of school children sitting in little groups and having lunch. As we walked past a group of girls one of them called out Haro (hello) to me. I replied with a “Konnichi wa” which seemed to surprise and delight them. I’m not sure why they’re taught “Haro” and I think “Hero” would probably sound more similar to hello. Maybe it's based on the American accent? 750 years since the temple was founded. Anyway, before leaving we also had a look at a big bell that was cast in 1255 using the donated funds of over one thousand people. It is actually one of two bells in Kamakura designated as a National Treasure; the other one is located in Engakuji. As we were both massive bell enthusiasts we decided to head to Engakuji next. This temple is located right next to Kita Kamakura station so we headed back along the road connecting the station to Kenchoji. After a short walk we found the entrance on our right hand side and paid 300 yen to enter. Engakuji is number two of the five great zen temples of Kamakura and was founded in 1282. One of the reasons the temple was built was to pay respects to the Japanese and Mongolian soldiers killed during second failed invasion attempt of Japan by the Mongols. We didn’t spend as long here as we spent in Kenchoji but we still had a good look at the buildings and around the grounds. After entering we walked under the recently built (1986) big wooden Sanmon gate and continued on to the main Butsuden hall. This hall houses a wooden statue of the Shaka Buddha and was also built quite recently in 1964 as the previous building was destroyed during an earthquake. One of the buildings is the Shariden which is a hall apparently containing a tooth of Buddha. The tooth is the other of Engakuji’s two national treasures, although unfortunately we didn’t manage to see it when we were there. However, we did manage to find the large bell up a flight of stairs. This bell was donated to the temple in 1301 and has a horizontal log hanging next to it, which is swung in order to ring the bell. Though these days, due to the fact that the bell is over 700 years old and a national treasure, I don’t think it gets bashed with big lumps of wood all that often. As we made our way between the different buildings we also spent some time appreciating the trees and statutes in the temple grounds. At one point we even saw some bald priests walking around in big long robes. While we were looking at the grounds a group of Japanese middle school girls came up to me and said “Haro” and asked me a few questions. I can’t remember exactly what they asked me but they giggled a lot. It was only after they left I realised it was the same group of girls that had said hello at kenchoji! Once we were done with Engakuji we decided to head back to Kita Kamakura station. We had only seen the two main temples in the area and there were actually another three famous temples located near the station. While we'd like to have had seen them as well we were a little short on time and had a bunch of stuff in other parts of Kamakura we wanted to see. There’s always next time at least! Kamakura is undoubtedly most famous for its giant bronze statue of the Amida Buddha and we thought w'd make this attraction our next stop. The nearest train station to the Daibutsu (大仏 = Big + Buddha) is Hase Station which is located on the Enoden line. From Kita Kamakura this meant that we had to first catch a JR train to Kamakura and then transfer to the Enoden line. Once we arrived at Kita Kamakura station we found a massive amount of school kids either waiting to get another train or getting off the train we wanted to get on. There were so many of them in fact that we had quite some trouble getting onto the platform and very nearly missed our train! Kamakura station was bigger that Kita Kamakura and mostly enclosed though still pretty small as stations go. When we arrived were feeling hungry so we left the station building and walked over to a nearby convenience store. Kate used their water (!) to cook the other packet of noodles she got from the cup noodle museum yesterday and I bought some boiled eggs and a packet of pistachio nuts. Once we had finished our food we went back into the station and used our Suica cards to get through the gates that led to the non-JR, Enoden part of the station. Kamakura is a terminal station for the Enoden line and there was a platform on both sides of the single track to allow smoother loading and unloading of passengers. The Enoden train looks more like a tram than a train and actually does travel along the road at some point. 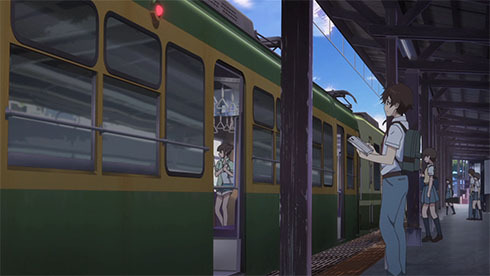 I didn’t take a picture of the train but since a few recent anime, such as Tari Tari and Tsuritama, have been set in the area I’ve included a screenshot from the show of the train instead. Once we arrived at Hase station we hopped off and walked up the street to Kotokuin temple where the Giant Buddha was located. As expected of such a famous location, there were even more people here than at even Kita Kamakura, although it really wasn’t anything too bad. Compared to Kita Kamkura we also found that there was proportionally less school children and more of a mix of ages. It took us about ten minutes to walk up to the temple from the station. Along the way we stopped in a couple of the shops that lined the sides of the footpaths and Kate tried a free sample of something that looked like a nut. She had quite the reaction to it! Neither of us have any idea was but it was apparently the most disgusting and revolting thing Kate has ever eaten in her entire life. She had to have some of my drink in order to remove the taste though apparently it still lingered for the entire day. I did much better with my food choice and purchased a Buddha shaped custard filled pastry thing. The pastry is a bit like a fluffy waffle and was pretty much Taiyaki in the shape of a Buddha rather than the traditional fish shape. It was really delicious! In fact, it was the best Taiyaki I’d ever eaten thus far. The food stand was located just opposite Kotokuin Temple and after I finished eating him we crossed the road and headed over to the real thing. Before we could get to the entrance though, someone came over to us and asked if we spoke English. The guy seemed a bit dodgy and since we were in a pretty popular tourist area and there were heaps of other foreigners around we were pretty suspicious. We’d had a couple of scam artists approach us before at really popular locations in Japan and had almost lost 100 yen ($1) to one of them once! At one point he went off to get something that was apparently written in English that he wanted as to look at and we used the opportunity to escape into the temple. I felt a little guilty as it wasn’t clearly obvious he was up to something but I figured that it wasn’t like we were the only English speakers around so if he was genuine I don’t think it would’ve been too inconvenient for him. In my Japan book I had that the admission cost for the temple was 200yen and I had a separate article for the Buddha stating that its entrance fee was 20yen. I assumed that this meant we’d have to pay 20yen to be able to see the Buddha once we were in the temple. I was surprised then to find that we could see him straight away without paying anything extra. I also enjoyed the fact that Kamakura’s Daibutsu was outside. It was actually located inside various temple halls for a few centuries but since the buildings kept being washed away by tsunami and typhoons the Buddha was eventually left to sit out in the open. Once we finished marvelling up at the statue and had a closer look around the base and found out what the 20 yen was all about. It turned out that this was a fee paid by those who wished to ‘enter the Buddha. I had no idea we could go inside! Kate was surprised too as she thought it was solid lump of metal. I pointed out though that if this were the case the Buddha would weigh around 2000 tons and the metal would be worth around $17 million dollars. Anyway, we decided that we'd very much like to enter the Buddha and paid our 20 yen to a ticket lady. While there was no line outside we found the inside was fairly crowded with people. It wasn’t particularly pretty inside though it was interesting to be able to see a kind of behind the scenes look at the statue. It was also weird to think that while we were appreciating and taking photos of that statue there were actually a bunch of people standing inside. After a couple of minutes of looking around inside we went back out and Kate said she needed to use the bathroom, so I went and sat down on some nearby steps. While I was waiting there lots of Japanese primary school students came up to me, asked me questions in English and got me to sign my name in their books! Since I wanted to practice my Japanese I answered their questions in Japanese. I was asked where I lived by one boy and after answering I asked him where he lived. He said "I live in Japan" which I thought was a pretty funny answer. When I laughed at that he clarified that he was from Ibaraki, which is a prefecture north of Tokyo. When Kate came back she was jealous at all the attention I was receiving and I explained that I had found that the best way to get them to come up to you was to just sit and smile in a kind of aimless way. Since she didn't want to look too creepy though Kate didn't try this method. When it was time to leave Kotokuin we went back out where we had come in and I got another Buddha-Sama shaped custard Taiyaki treat. This one had just been freshly baked and was even better than the first! As Kate also wanted something sweet we went into a shop and bough a small box of these pigeon biscuits that were sold everywhere. Our next destination was Hasedera (Hase Temple) which was located back down the road near Hase station. Along the way we stopped and a post office and I got some money out of the ATM. After I had my money we went to continue on our way to Hesedera when Kate decided that she’d like to get some more money out as well. While I waited outside the post office I tried the smiling trick on the kids that were walking past and got to sign my name in a few more books. Unlike the two temples we’d visited near Kita Kamakura Hasedera is a Jodo sect temple and is famous for its eleven headed 9.18m tall Kannon statue. The wooden statue was one of two carved out of a massive camphor tree by a monk over 1280 years ago. While the other statue was immediately enshrined at Nara, the one currently at Kamakura apparently made its way to a nearby beach after being set adrift in the ocean. After being found in 736 Hasedera was immediately constructed in order to house and honour the statue. Upon arriving at Hasedera we paid the 300 yen entrance fee and went in. Soon after we entered a lady approached us and said she was from Kanagawa Tourism and could we please answer a survey. She asked us the questions in English and I tried to answer in Japanese. It was a pretty unrigorous survey and she actually seemed more interested in getting some sort of answer down rather than the correct answer. The lady struggled a bit with a few of the questions and had to just point to the survey sheet at times. She was very nice and friendly though and we didn’t mind helping her fill out the survey at all. I tried to clarify and make sure it was filled out as correctly as possible. At one point we were shown a list of Japanese cities and were asked to tick those that we’d been to and circle those that we’d heard of. We ended up ticking quite a large number of them and circling all but one place, which seemed to impress her quite a bit. The final question was something about what should be done to improve tourism for English speaking visitors. The lady actually tried to get us to tick the “Improve English signs” option but we instead said that improving online information would be best. When we had finished the survey the lady said that she had a “Purezento” for us and we both received a free red bag thing! After saying goodbye and thank you to the survey lady we went and explored Hase Dera. It actually turned out to be one of my favourite today as there were lots of things to see. We even noticed that there were lots of pretty flowers in little bunches that were for sale around the temple. Like many in Kamakura the temple was built into a hill and there was a path leading up to a viewing area. The walk up was much shorter than the one at Kenchoji and the path weaved its way around some nicely kept gardens. At the top we were able to enjoy a good view over Kamakura and its beaches. After walking back down we had a look at a really nice garden at the base of the hill. The garden had some little trees stone steps and a pretty pond with lots of carp. Near the garden we found and went into our second cave for today. It was much smaller and more developed (wider passageways, more lighting) than the one we went to in the morning- we were also allowed to take photos inside. So I was able to take a few shots. One thing that was similar was the uneven gouged out texture of the wall which is a result of the caves being dug out by hand. After exiting the cave we had a look in some of the buildings. We made sure to have a look at the big wooden statue of Kannon which was gilded with gold and also saw another smaller statue of Buddha. At one point at the temple grounds we were able to enjoy another view of Kamakura although it wasn't as good as the one from the top of the hill. After we had looked at everything at Hasedera we made our way back to Hase station. By the time we arrived we only had three minutes to wait until our train arrived but for some reason Kate didn't want to wait around so we had a little look in a nearby discount style shop. I think it was a pharmacy although since we had such a limited amount of time we only had a really rushed look and didn't buy anything. On the train trip back to Kamakura a lady across from us noticed and pointed out to us that she and Kate both had the same packet of pigeon biscuits. She actually made a fairly big deal out of it which this was really strange as the biscuits were sold everywhere in Kamakura and heaps of other people on the train also had them. Apart from that though she seemed pretty with it so I have no idea what it was all about. After alighting at Kamakura we took the east exit and went through some big red tori gates into a pedestrian street lined with many food shops. Our destination was Tsurugaoka Hachimangu Shine which was located near the end of this street. One of the shops we passed was selling rice crackers and Kate stopped to buy a soy flavoured packet. Unfortunately though, while she didn't hate them, Kate didn't really like the crackers either and ended up throwing out the packet after eating only a few. I felt a bit sorry for Kate as she was not having the best food day today! After about a fifteen minute walk we reached the end of the street and walked across the road over to the shrine entrance. As we were feeling pretty tired and it was quite late in the day we decided to make this our last destination for the day. Tsurugoka Hachimangu was founded around 1000 years ago in 1063 and is Kamakura’s most important shrine. 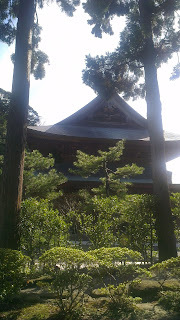 It was for many years also a Tendai Buddhist temple which serves to explain its temple like layout. 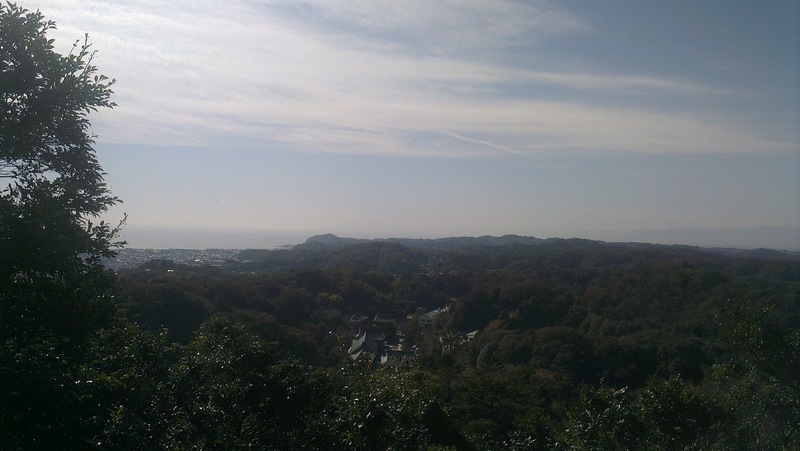 Kamakura grew around the shrine and is now currently located at the geographic and cultural heart of the town. Tsurugoka Hachimangu honours the patron god of samurai and is believed to contain the enshrined spirits of Emperor Ojin, Hime-gami and Empress Jingu. One thing we’ve noticed in our travels is that while you generally have to pay to enter Buddhist temples, Shinto shrines are usually free and Tsurugoka Hachimangu was no exception. Before getting to the main temple area we passed by some ponds and went up many steps. We were actually feeling really tired so we didn’t spend too much time looking around at the shrine though we made sure to go to the very top of the stairs and got a good view of the area. At the top of the stairs there was a big impressive red building that was the Hongu (main shrine). 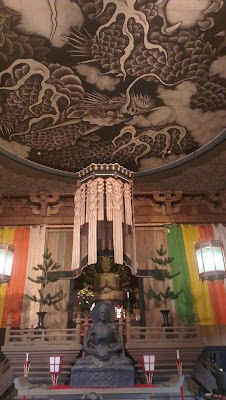 There were a number of other secondary shrines located around the place as well. Tsurugaoka Hachimangu had lots of primary school kids and it looked like they were also wrapping up for the day as they were all sitting down in front of various teachers. On the way back to Kamakura we walked down the middle of a car street that ran almost parallel to the pedestrian one. It was also quite nice as there was a park down the middle lined with heaps of cherry trees. By this time was getting pretty close to dinner time and after watching me enjoy lots of convenience store eggs over the last couple of days Kate decided that she would like to try some too. There was a convenience store located about halfway down the road we were walking on and we stopped in to have a look but sadly they were all out of eggs! Once we got the station I had a look using Google maps on my phone and found that there was a Family Mart conbini nearby. We had a quick check in there and happily found that they had lots of eggs! We each bought two eggs, a yogurt and a banana and then returned to the station and caught the next train back to Tokyo. Soon after we had settled into our journey back we got started eating our food. Kate started with a yogurt, and I an egg. I always had a little trouble cracking the shell and today was one of the times I had to use my teeth to create a small hole which I could then expand with my fingers. The egg was delicious as always! I don’t know how they do it so perfectly every time but the yolk is always a little soft and the whole egg slightly salty. We’ve tried to boil our eggs in salty water but we couldn’t get the salt to penetrate at all. When it was Kate’s turn to eat her egg she also had trouble cracking the shell and I advised her to use her teeth. When she did, it exploded! It was quite a shock and Kate was pretty mortified. I suggested that perhaps it was just a bad egg and that she should try the other. To Kate’s dismay and probably the humour of the other passengers (though they were doing a good job hiding any amusement), the second egg also exploded all over her. I had a closer look at her packet and written on the side was “生卵” (NamaTamago). This means “Raw Egg”, though was actually very slightly cooked but was definitely too runny to eat. Apparently a bit of it ended up in Kates mouth and she described it as “Very yokey”. I had no idea the eggs were even sold like this and the ones I had got always had “ゆで卵” (YuDeTamago = boiled egg) written on the side. I felt really sorry for Kate at this point and gave her my other boiled egg. Since her experience was so traumatic though Kate apparently didn’t really enjoy it all that much. We were both really tired when we arrived back in Tokyo so I don't remember too much about what we did. It was our last night in Japan though so we were probably feeling a little glum. We can't have been too miserable yet though, as we had almost a full day before our plane left to enjoy a few more things in Tokyo, including Karaoke and the Tokyo Sky Tree. Your blog is awesome. You are so funny sometimes. I love the Starbucks Muffin adventures and your advice about staring aimlessly. The egg thing is right out of a comedy movie. Though I do feel bad for Katie and that day's food disasters. I'm wondering what she ate that tasted so bad. Did you ever find out? I'm very glad you've returned to Japan, so I'll have more of your blog to read. I still have no idea what it was- I'm just glad I didn't have any.